I am surprised constantly that there isn’t more noise online about Andrea Maack and her fragrances. Early on there was some chatter about them being derivative but I’m yet to discover a scent that smells markedly like an Andrea Maack. Of course there are notes that correspond, even accords, but the whole fragrances I find distinctive enough to set them well apart even from their most obvious comparisons. Maacks are sometimes challenging and yet ever so wearable. comfortably weird. Yes, I know I’m in the minority here. This is a sample that I’ve had for a while and keep getting out, spritzing and putting away. Dark. Sparkling sweet citrus and cold water in opening. Reminding me of a zinging, sharp, dew spotted early morning at sunrise in very early spring. There is a feeling of briskness and action which quickly morphs into fruity (apple and melon?) rose and a cold metal spoon in your mouth. Or the first sip from an icy cold can of fizzy drink. The fruits become more prominent towards the heart, they are just out of the fridge, and the rose becomes air conditioned. This is a modern metallic radiant rose. The most close resemblance from my memory (not perfect) is modern Eternity Woman by Calvin Klein, yet nothing like it. After some time Dark gets a Pez/sherbet feeling that makes me smile, especially floating over the metal rose from Mars.Cruising into dry down the rose becomes colder like it’s frozen solid but curiously warmth surrounds it, the amber brings in a hint of warm resins that take us to the end. I can see how anyone who wants their fragrant ride to be smooth and cohesive with the department store finish would find Dark disjointed and surreal but that’s one of the things that I really enjoy. If wearing fragrance for my own pleasure then Dark is an excellent choice and it’s not so powerful that people around you will be questioning or freaked out, though longevity is nuclear. Quietly and subversively weird, perfect. Do you have a favourite under rated house? Which one and why? WOO HOO APJ! Thanks for getting involved. Another wonderful giveaway, you are lucky. I hope life is treating you well where ever you are. The winner will have till Thursday 3rd September 2015 to get in touch (portia underscore turbo at yahoo dot com dot au) with their address or the prize will go to someone else. Andrea Maack, artist, fashion designer and fragrance curator. Her stark, vivid, linear creations are bold and shocking but within the bounds of mainstream beauty. Though I find them confronting and they give me pause for question I could also see many of her art creations in peoples homes, comfortably setting themselves beside a big family couch and the TV. They would be interesting talking points but hardly steal air from the room and make it awkward to sit. This too is how I see the fragrance line. Different enough to maintain my interest yet wearable every day as a second, fragrant skin that you offer to the world as your scent. The line has been called derivative and a follower but when I wear Andrea Maack fragrances I find no parallels, and yes this could be my lack as a medium. Whether they are or not is a moot point because I enjoy wearing them, they tickle my fabulous bone and they tick so many boxes on my fragrant list that I am impressed with them on their own merits. Sweet citrus opens but it’s firmly undercut by green grasses and a fresh, dewy, air conditioned bouquet (I’m quite surprised there’s no LotV mentioned in the notes). A lovely and very pretty green, delicate, cooling and …… imagine you are in an orchard filled with blossom, the day is brisk but when you stand in the sun it’s lovely, there’s a breeze that is strong enough to ruffle your hair and it carries a floral bouquet from the nearby market gardens, some trodden grass and a dry rasp that is a little vetiver reminiscent. Then the sprinklers come on, they don’t wet you but it does change the taste of the air and suddenly the whole orchard seems cooler: that moment in your dream is what Silk smells like. The freshness and brightness are carried over into the heart and it’s reminiscent of the freshly cut cucumber scent, or cut wet stems of flowers before arranging. It’s amazing how intoxicating silk is, not a big perfume but it does have the ability to change the air around you and in the first hour the sillage is excellent. Like the Andrea Maack art piece below Silk is a bundled net of scent pieces with light pouting through and creating a gauzy, soft focus fragrance that still manages to be fully present and fragrant. For me Silk dries down to a melon scent softly warmed by the amber that I can feel but not really smell. Have you experienced any of the Andrea Maack fragrances? Favourites? 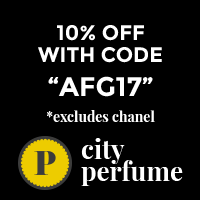 Open to everyone worldwide who follows AustralianPerfumeJunkies via eMail, WordPress, Bloglovin or RSS. Please leave how you follow in the comments to be eligible. I must be able to check that you follow so if you have an email address on your gravatar that’s different to your follow address then please email me (portia underscore turbo @ yahoo dot com dot au) so I know. Yes, you can start following to enter, in fact it’s encouraged. Entries Close Sunday 30th August 2015 10pm Australian EST and winners will be announced in a separate post. When I first fell in love with the Andrea Maack range I remember there being a lot of chatter about it being derivative and boring. There were some bloggers and some of my mates who seemed very upset about this brand. I’m sorry but I never felt them to be either boring OR derivative. First to admit I’ve not smelled everything ever produced, also first to admit my memory is shot but few houses hit me as hard in the heavenly eye roll and full body purring shiver as Andrea Maack’s do. There are two FB in my collection Silk and……..
To my nose Sharp has a remarkably complex fragrance story. The orange blossom is not at all as expected, like they have added some herbaceous spiciness, and the vanilla is an inedible warmth that is fuzzed up by the musk. At once bright and cozy like the smell of brand new polar fleece with dirty, morning bed-hair. Sharp is feral and cuddly, pithy, furry, smooth and enfolding. Sharp has a sweet indolic weirdness that is at once repulsive and alluring up close but merely pretty and inviting from further away. The name Sharp seems to be a complete misnomer here and I wonder if that is intentional? Sometimes when I wear Sharp my feeling is as if I’ve been up in an attic rummaging and my hair is thick with dust and old air,. Other times the feeling given is that I’m cuddled up in front of a fire near a recently beeswaxed table and the fires heat is warming the scent through the room and I feel warm, safe & loved. There’s even something of dog paws. I get a nearly linear lifespan that weaves rather than evolves but as it dries down Sharp by Andrea Maack is sweet vanilla dribbled over musk, the feral has disappeared and it’s all about clean (but not too clean, there’s still an element of humanity). Who would I spritz with Sharp? That’s hard to say, I think some of my friends who like fragrance very much but aren’t perfumistas would love this as a go-to daily scent regime. Certainly the art connection, lack of ready availability, simple, stylish bottle and the reasonable price bracket would make it a good choice for them. Considering they would pay around these prices for a bottle of designer/department store fragrance Andrea Maack’s scents are a much better and more interesting buy. Have you tried the Andrea Maack fragrances? Do you think it makes sense to add olfactory experience to visual arts?